Today the Google has come up with a colorful doodle which marks the winter solstice. 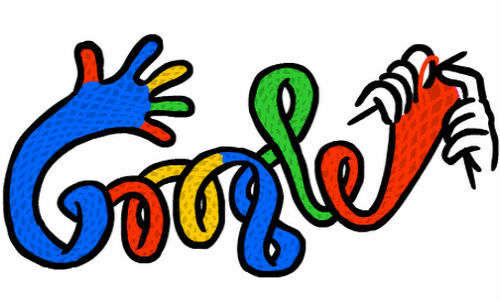 The doodle features pair of hands weaving a long woolen hand glove and forms Google letters. On June 22, 2011 Google had posted a floral 'first day of summer' animated doodle on its India home page created by Japanese artist Takashi Murakami. The December 21 is the shortest day of the year and the longest night of the year in the Northern Hemisphere. This is the day the sun is to the farthest south. The winter solstice occurs on June 21 or 22 in the Southern Hemisphere when the sun is the farthest north. The solstice happens twice in a year, during summer and winter. On a solstice the sun is at its greatest distance from the celestial equator. During the summer solstice days are the longest and nights shortest and the opposite of this happens on the winter solstice. On a solstice the sun is at its greatest distance from the celestial equator. The solstice happens when the sun reaches a point where it will appear to shine farthest to the south of the equator, over the Tropic of Capricorn. The reason behind the occurrence of winter solstice is that the Earth does not spin upright, but on an axis 23.5 degrees from the vertical.